Blogger is not handling images properly. Click on the above picture to see it more clearly. If you haven't been watching the action: The application of existing circuit breaker rules meant that the market opened, went limit up, opened again, went limit up, and closed for the day. The action on the currency, and look at Nifty futures trading at SGX (!). The main story, as I see it, is that the BJP and the CPI(M) (put together) lost a vote share of 3.69 percentage points, and a vote share of 2.02 percentage points was added to INC. Of course, the above are net numbers, there must be much more going on by way of gross flows. We were tracking SGX NIFTY all through the morning, and not very surprisingly, the volume turnover was one of the lowest in NSE. To the tunes of 3k crore. Around 90% which makes around 2700 crores was in FNO and the rest was in cash. Very canny players could have seen a decisive move if they would have followed the huge 3300 PE activity on Friday. Till the last week, open, 3400PE was the hedge everybody was working on, yet on Friday, masses started becoming increasingly bearish. 1A) the unexplained rally last month (IN THE TOTAL ABSENCE OF ANY GLOBAL/LOCAL INDICATORS) could have been BLACK MONEY REPATRIATING INTO THE INDYAN MARKETS ahead of BJP warnings on the current trend of global distaste for hidden numbered accounts in Liechtenstein Switzerland etc.. (one mr. khan a stud farm owner in Pune may be a "bundler" of hawala transactions in this regaRD for the congress party). 1B) INSIDERS (maybe congress) in general knew the election would be a landslide and 'quietly' took positions in INDYAN stocks, reaping the rally of May 17-18,when the masses piled in! This immplies the ELECTION WAS RIGGED. (Oh yeah...like it CANT HAPPEN in INDYA!) of course IT CAN. THE EVMs are a joke: just switch the photo insert of 'other' party/ies to the button of your choice. Otherwise, put an extra OR GATE digital logic into the other buttons, outputting into Congress memory! end of story. cost of rigging an evm: at most 50 rupees. audit trail in country of 1 billion: NIL. Result: Headlines. Are we to beleive that congress party is NOT in bed with Mamta Bannerjee given free hand to attack ratan tata, and NOT in bed with Raj Thackeray beating up pooor people willy nilly? this is the winning party? benefitting months after a terror attack on a ratan tata hotel in which CM was in GOA and ignorant? So it is clear: if you attack indyans "hard" you win? this is the formula forelectoral victory? meanwhile the voicestitutes of the NDTV are laughing over coctails with Kapil sibal? What do you mean by FNO, PE and smart money effect? rising calls and puts, given a rising underlying implies higher expected volatility for a given time period and strike. So if they are both at the money, shouldn't calls appreciate by more compared to puts for an increase in spot and vol(ceteris paribus), for parity to hold? Also, wouldn't straddles effect calls as well? Assuming rajan's conclusions are incorrect - lets hope that all this optimism is actually realised in terms of policy. I perfectly agree with you. But this was not my point. 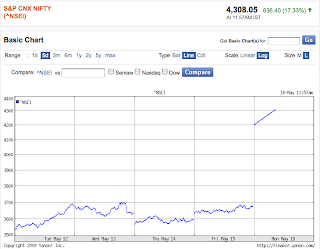 The underlying on NIFTY on Friday close was 3684. The straddles of 3600PE and 3800CE is normally what the market participants were leaning at, but yes, 3500PE and 3400PE were equally hot. How am I saying this? 3400PE OI was around 6million. Logical because 3400 is the 200DMA. But what my point is 3300PE OI was the second, 5.6million. Next came 3500PE, around the tunes of 5.2million, circa. Now 3800CE OI were equally hot. Around 4.1million. Straddle is in effect, and yes, the long leg of the straddle in such a 6 sigma event,[can it qualify?] was immensely profitable. But I am making a salient point. The point is this, the majority were leaning towards the lower sides, with PCR OI running close to April-May highs 1.36ish and above. And this PCR was should not have been treated as a contrarian signal, because puts were not only hoarded because of hedge but also to reflect the bearish opinions. Yes, 3300 PE should not be treated as a hedge,by us [by the way, 3200PE OI was either low or nowhere close], 3400PE can be, 3500PE can be, but 3300PE was a bearish call [if you say its a subjective argument I will agree]. A little bit of background will be nice here: During the entire week, 3400PE saw a huge OI, primarily because of the aformentioned reasons, 200DMA. OIs were high in 3400PE all around.So if you see the change in percentage 3300 will definitely the cake. And I agree, both puts rising, and calls rising is in anticipation of higher volatility, [vega is same for both call and put]but rarely seen.I didnt find such a behaviour even in Oct08 crash. Would like to know if somebody has witnessed such phenomenon. Much could not be said, about it, because such a rare events it cannot be found out by normal large sample statistics :D [they are rare], in fact today was the first day we had UC and not one, not two but three, its very difficult to study it under the realms of conventional statistics the days preceding such events and the days after such events. Anticipation of volatility is important consideration, but 30% or more, was sheer shattering. Thanks for taking the time to explain that - I'm sure a lot of readers here have benefitted. Personally, I can't see why 3300 puts are not considered hedges, if you expect something drastic coming up post elections. Something that will tell you a lot more, I think, are put prices/activity this week. Do shed some light on this if you get the chance. Some clarification on what you meant? This is interesting. In addition, for fun, I think you would like researcher cartoons on VADLO search engine.